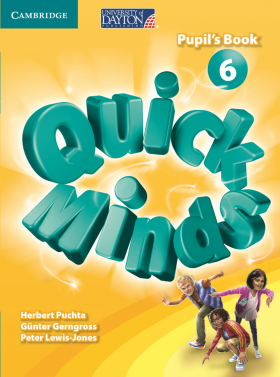 Written by a highly-respected author team, Quick Minds has been carefully crafted to help your students achieve their full potential. The syllabus guarantees solid and progressive language acquisition, along with the Key Competences. It also follows the Young Learners Tests syllabus, completing Starters by 3rd year of Primary and Movers by the 6th year. ‘Learn and Think’ CLIL lessons encourage students to apply English to the world around them. Focus on typical problems experienced by Spanish speakers with pronunciation, intonation, vocabulary and grammar. A unique Augmented Reality app allows students to scan pages of the book with a smartphone or tablet and access extra online activities. 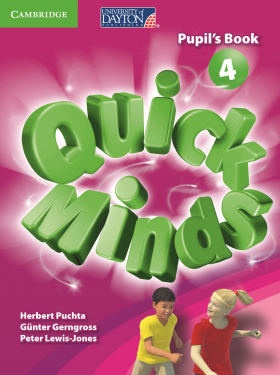 Flexible units with core content backed up by additional skills and CLIL lessons. 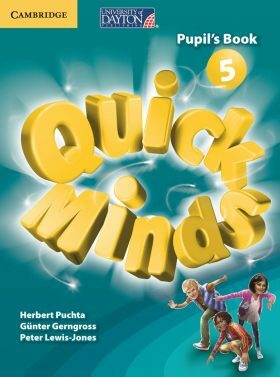 Special creativity lessons that stimulate children’s imagination. Motivating activities that help children develop thinking skills. Social awareness topics presented through stories. A gradual approach to reading and writing, particularly in level 1. Block letters in level 1 and handwriting font to meet official requirements. Engaging characters accompany learners on their journey and, as students grow, so do the characters. Downloadable resources: Class Audio, Teacher’s Resource Book with photocopiable worksheets and tests, and Wordcards 1 and 2.